A man's disastrous life is changed by his new room-mate. 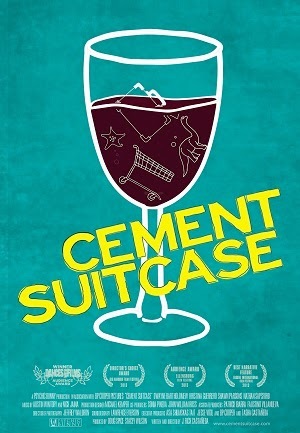 Cement Suitcase is a surprisingly charming little “dramedy” about a man, Franklin, who is in the rut of a lifetime. His mother has died recently enough that he hasn’t been able to move just yet. His girlfriend is cheating on him with a guy who insists they should become friends. He hates his job and doesn’t get along with anyone he works with, because he talks down to them and drinks the days away as he entertains customers. Then, as if he doesn’t have enough problems, he is on the verge of losing the home he grew up in to the bank. With all these issues, it seems that the root of Franklin’s problems is that he is realizing that his life isn’t adding up the way he thought it should. Luckily, life has a surprise or two in store for him as he meets his new roommate Jackford, a man who is about to change his life forever. The biggest asset to the film is definitely the script. The writing does a good amount of work building its lead character while simultaneously giving a genuinely funny, dramatic and fulfilling character arc. Even though Franklin is far from a perfect guy, there is something about Bartholomew’s performance that really draws the audience in to really want to get to know him and root for him to turn his life around. Franklin’s girlfriend, Charlene, is definitely the least developed major character because all we ever know about her is that she is with two guys at the same time. We don’t actually know if she actually cares for Franklin at all because all of their interactions come off as awkward, not awkward as in bad acting or anything like that, but awkward in a real life way, that they are clearly still together out of convenience rather than actually caring for each other. On the other hand, at times it feels like the filmmakers tried to pack in too many themes and too much symbolism into the film that by the end they end up running out of time to resolve everything adequately. Then at the end they clump whatever is left into one action to which we have to assume Franklin will work out later. Also, there are a couple of scenes in particular where the transparency of the characters and themes is so great that it feels like the film is trying way too hard to arrive at simple resolutions. As Castaneda’s first feature attempt as writer/director, he shows a lot of promise with this simple, yet effective story that at times tries to be deeper than the audience may be anticipating. Sadly, even with a decent story arc that has a couple of moments of impactful symbolism, Castaneda’s inexperience proves to hinder the film from being truly great when a handful of moments end up missing their mark. Luckily though, the charm of the storytelling, mixed with the few ideas that do land, ultimately add up just enough to make the film stand out from the crowd.